Can you even believe that I missed my own baby's birthday? My blog turned one and the day just passed by like any other! How did I let that happen? This little blog of mine brings me such joy and happiness and I let its birthday pass by unnoticed. For shame. To make up for it, I'm throwing a belated blog birthday party and you are invited! What's a party without favors, right? So I have some fun freebies to share with you. I have been eyeing up those Pixie Stick birthday balloons floating around Pinterest, but something inside of me is saying, "You're going to give your students a ginormous straw filled with sugar...are you INSANE!?!". Until I resolve that disagreement with myself, I'm going in another direction. Although I've been known to change my mind so who knows what I'll actually do next August when I'm setting up the room again. I have two alternate ideas, shown in the pic above. One does involve candy - but it feels a little less panic inducing than the jumbo sugar straw. This one is a birthday candy bar. These would be pretty easy and relatively inexpensive if you buy the candy bars at Sam's or Costco. You can just cut and wrap them all at the start of the year (and hide them from yourself during that time of the month) and you're ready for any birthday! There is a little poem on the back says A birthday treat is always fun, but it’s not over when the candy’s done! Bring this wrapper back to class, because it doubles as a homework pass! Click the pic to grab your copies! The second one is a pencil flag. 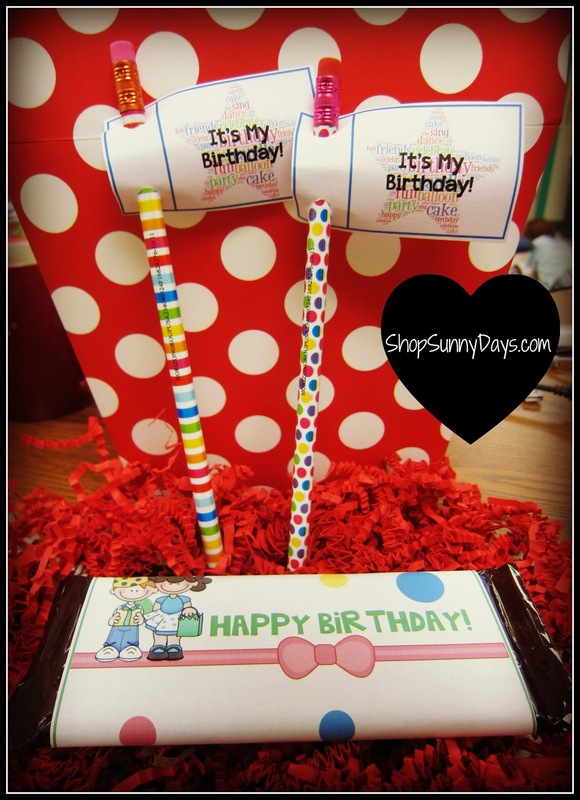 Kids love a new pencil, so you can quickly and easily dress one up for your birthday kid! Just cut the flags apart, pinch it in half horizontally and punch a hole to slide a new pencil through. Fun & super cheap easy on the budget. So, we have a celebration, we have gifts, now we need guests! 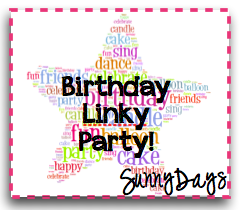 I'm throwing a little linky party so that you can all share your classroom birthday ideas! I'd love to see how you celebrate birthdays in your room. 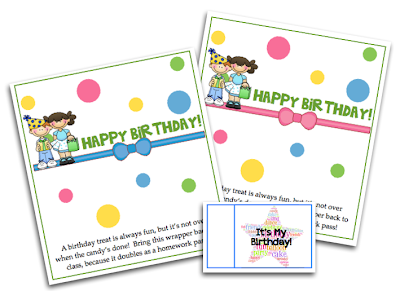 Feel free to share anything birthday related - birthday bulletin board ideas, parties, freebies (just not a paid product please). You can link up a new post or even a "vintage" post, but either way, please grab the image below and link back here to this page so that everyone knows how to get to the par-tay! Happy Birthday! Thanks for the linky party! Happy Bloggy Birthday - always enjoy reading your blog. I love how the candy bar doubles as a homework pass! I am doing the Pixie Sticks this year, but the kids don't choose theirs until the end of the day (i.e. all that sugar goes home for them to enjoy!). I couldn't get the link to work....maybe just me. I have done the pixie sticks and they choose at the end of the day as well and eat them at home....with the parents. Haha. Thanks so much for telling me. I think it's fixed now. The polka dots are really fun! Great colors. CONGRATS on the one year birthday! Thank you! Your candy bar homework pass may just be my birthday treat for next year. I, too, loved the pixie stick ballloons. I went a no sugar route this year by attaching them to crazy straws. They were a hit with the kids and at 6 for a dollar at the Dollar Tree they are super cheap. Glad your blog provided a positive outlet for you...and that you didn't let Debbie Downer and her friends get the best of you. Stay focused on the positive! Thanks for the freebies and the links! Love your ideas...Thanks for being so positive and helping to lift me back up!! Love your blog! I found this post through Pinterest and am SO glad I did! I love this alternative to the pixie sticks! Thank you for sharing! And happy belated Blog Birthday! !